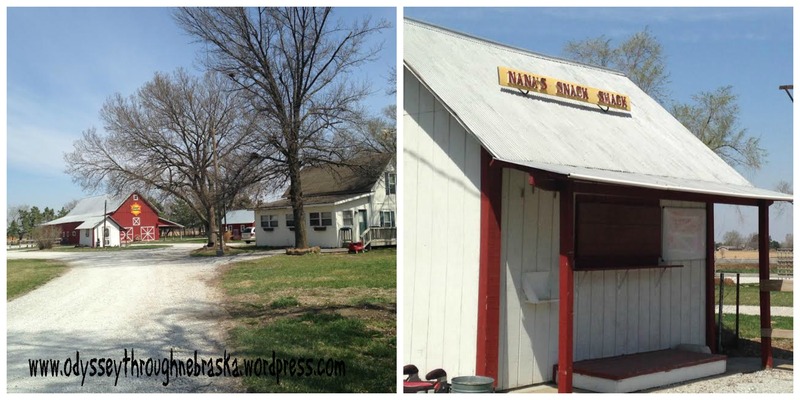 I have been looking forward to telling my blog readers all about one of our favorite Nebraska places. 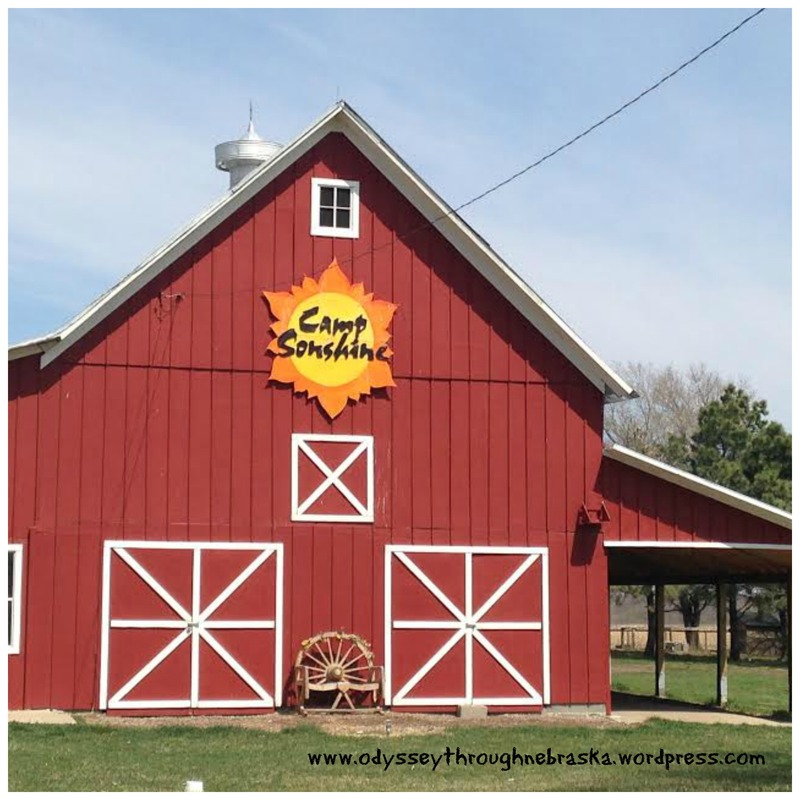 Our kids have attended Camp Sonshine day camp for several summers. Jeff and Trisha Keiser and many of her Schrader family relatives oversee the camp. (My best friend from high school married a Schrader – they have all had a special place in my heart for a long time!) The Schrader farm is still fully operational, but the real passion in their life is running this camp ministry. I was privileged to write about the camp in the most recent L Magazine! So, I will not go into how it went beyond a farm to a camp here, but I hope you will take the time to read the article! Anyway, here is the mini tour as promised. What do we love about the camp? First of all, their goal to keep the Son as the focus of the week. This camp shares about God and how He can impact daily life. Another aspect we love – such a beautiful setting! The camp is less than 10 minutes from the southern edge of Lincoln, but you feel like you are miles and miles away from the city! A highlight for my kids is Nana’s Snack shack. This could partially be because they like to pick out their own sweets. But I think it is just as much because of Nana who runs the place. Trisha’s Mom considers this her ministry – smiling and helping the kids to have a sweet time. Now she has her own crew of nana’s coming out to help when it is their grandkids’ turn at camp. Another great thing is their goal is to have Camp Sonshine be “Lincoln’s camp.” This evident everywhere, even in the bathroom where the kids could paint a tile in honor of someone they love and to beautify the camp. Also, the counselors who take such an interest in the kids’ lives. We have seen some of them around town, and they are still excited to see our kids! How wonderful to see positive young adults making such an impact in the lives of my kids! This is the beloved camp barn that underwent a dramatic makeover (see the L Magazine pictures – you won’t believe it!) 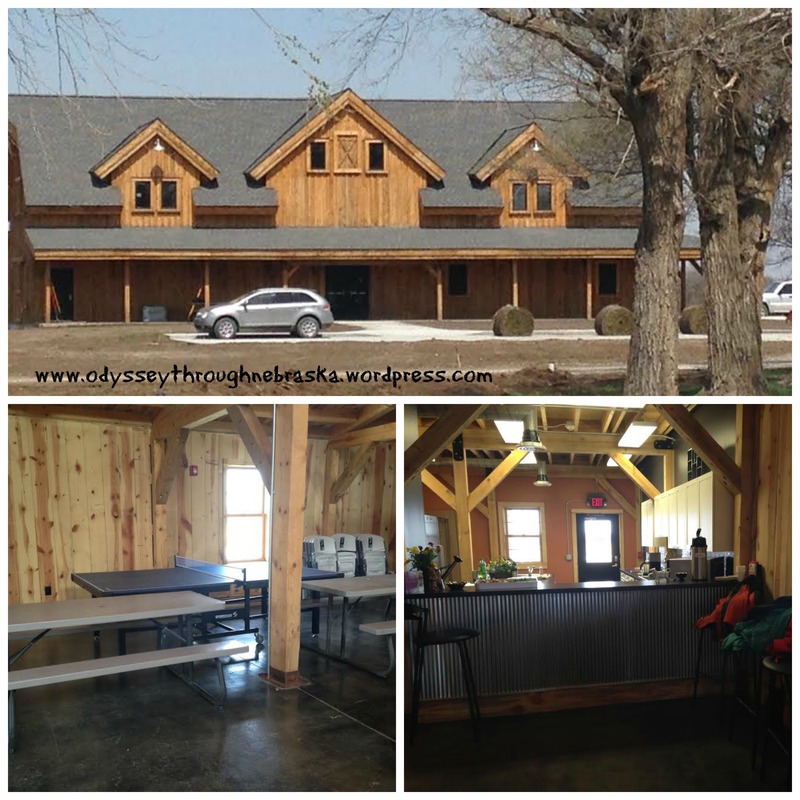 The barn has served many a breakfast and has been used for storage and much more. The only problem – not exactly enough room to shelter all campers from the heat or storms. Or enough room to serve a meal. So, several years ago they began to raise money to build a new barn. With the help of God and the community, they reached their goal! This beautiful building will allow them to continue to impact the lives of the community! The exciting thing is you can tour the camp yourself TOMORROW. They have all sorts of fun events planned for the family. Here is the description directly from their website. The 2014 Spring Open House & New Family Orientation will be held on Saturday, May 3rd from 2:00 – 5:00 PM. Come tour the grounds, try some activities, meet some of the staff and get your questions answered. – New Facility GRAND OPENING CELEBRATION!!! From 5:00 – 7:00 PM on Saturday, May 3rd, after the Open House, we will be celebrating God’s faithfulness in providing camp with our new recreation facility. If you would like your child to have an unforgettable camp experience, they are still taking applications for this summer. You can contact them via their website or call (402-423-8746). By the way, you can find Camp Sonshine at 13440 S. 25TH St. (just off of Saltillo Road) in case you want to go to the open house. Should be a beautiful day to get out of the city! Normally for this type of column, I feature many different photographs. Today I wanted to focus on just one! This commissioned sculpture is entitled, “All Creation Praises.” For me, this piece just reflects joy. I think it is beautiful. 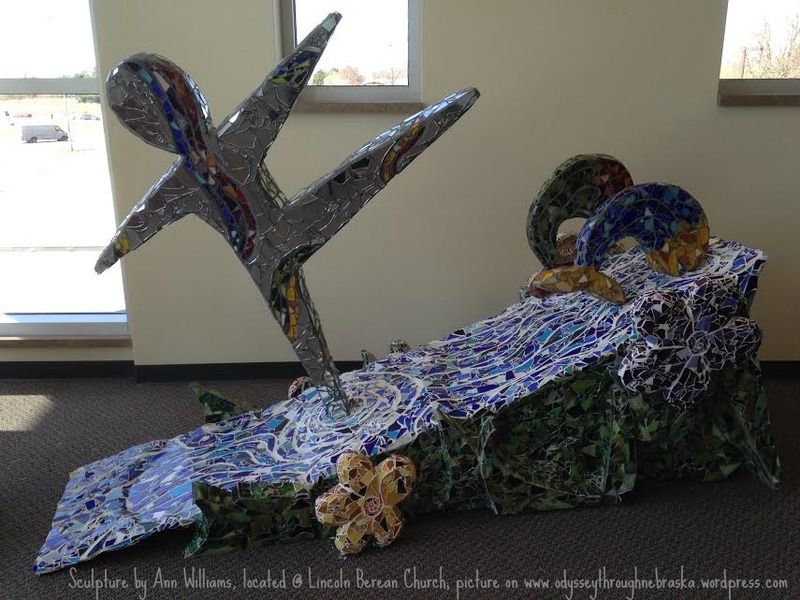 Living in the Lincoln area, the artist Ann Williams happens to also be the Visual Arts Director at Lincoln Berean Church. Several of her pieces are on display there. To learn more about how and why she created this particular piece, you can visit her page on this artwork. I debated on trying to summarize her story, but I feel that I would lessen the impact of her sculpture. If you look carefully at both her website and my blog post about the Lincoln Berean Church “Art Gallery” yesterday, you may notice a few more of her pieces. What I appreciate most about her work is her intentionality and purpose behind every piece that she creates. I look forward to seeing what she comes up with next! For the past two years, my kids have participated in the summer reading program at Indigo Bridge Books in Lincoln. 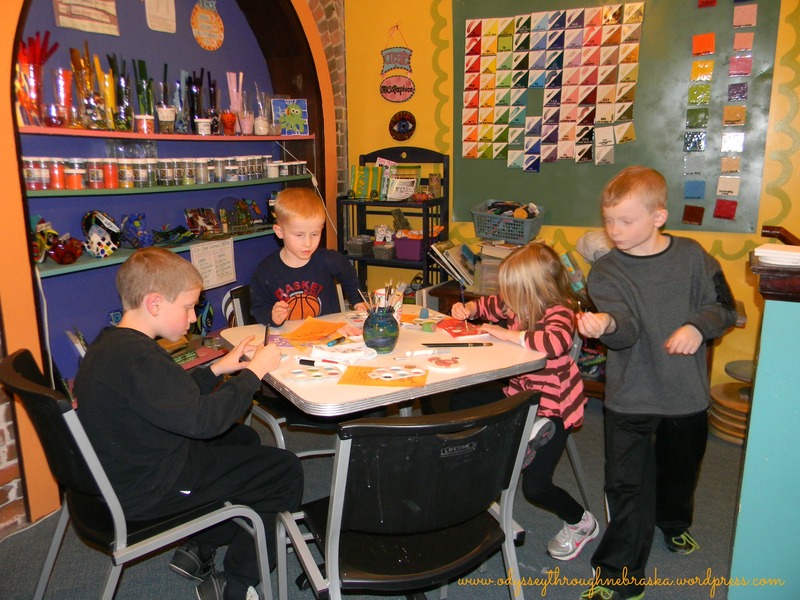 One of the prizes both summers was a free hour of painting pottery at Paint Yourself Silly in Lincoln. This has resulted in the creation of unique Christmas gifts for the past two years in a row. They love getting paint on a “blank canvas,” and I love the fact that coasters can be a useable keepsake. As opposed to pieces of paper that constantly fall off of the refrigerator… I enjoyed watching them to determine their designs. The best part – I am not tempted to help, since then I would have to pay for an hour of painting. The project is truly theirs. Then the mess is truly “Paint Yourself Silly’s” – no clean up required. That is another great part! The paint selection process is even fun, and they have added glass fusing and mosaics to their project possibilities. If you bring a friend on Fridays from 6-9, you can paint for half price. And if you wear comfy jammies on the first Friday of the month, you can paint half price from 9-midnight. Plus they have a flat fee if you want to “paint until you faint” all day. Several discount options. The normal fee per hour of painting is $6 an hour if you are above 10, and only $4 an hour for kids under 9. The pottery is purchased separately and varies in cost based on size and intricacy. They also have birthday party and other event options (including preschool story time). Plus they have a location in both the Haymarket and in Southeast Lincoln. Hours vary at each location. We all love to go to Paint Yourself Silly and highly recommend the experience! I meant to do this post 2 weeks ago on “Small Business Saturday.” Can I blame my lapse on lack of batteries? I accidentally ran down my camera batteries and could not find my charger for awhile. So, when I finally downloaded my pictures, I found the photographs of one of my favorite places to go across the state! 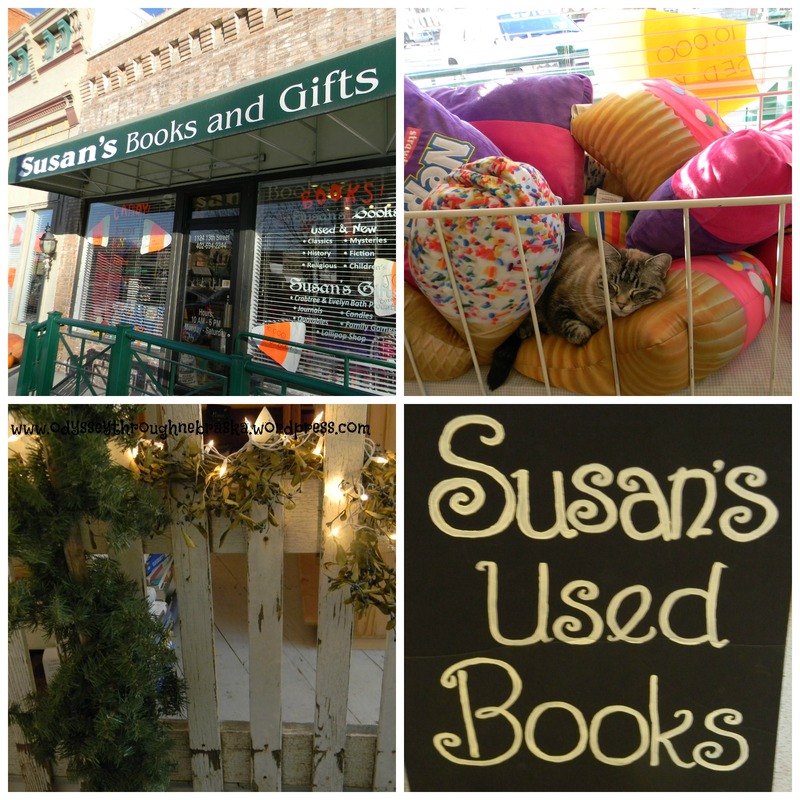 Susan’s Books and Gifts is located on Aurora’s town square. My extended family is from that area, so through the years we have often found ourselves at this lovely and whimsical place. 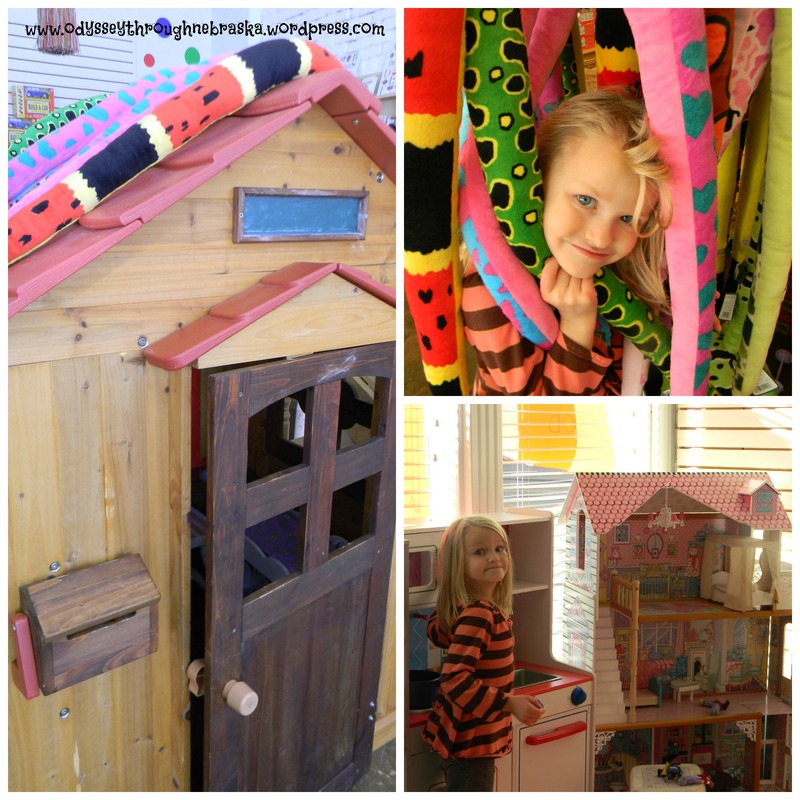 What the store has to offer is endless possibilities! Here are a few more of their displays. My daughter loves playing with the kitchen and dollhouse. My boys generally camp out at the train table. I wander around picking up a few things and trying hard not to spend as much as I really want to. 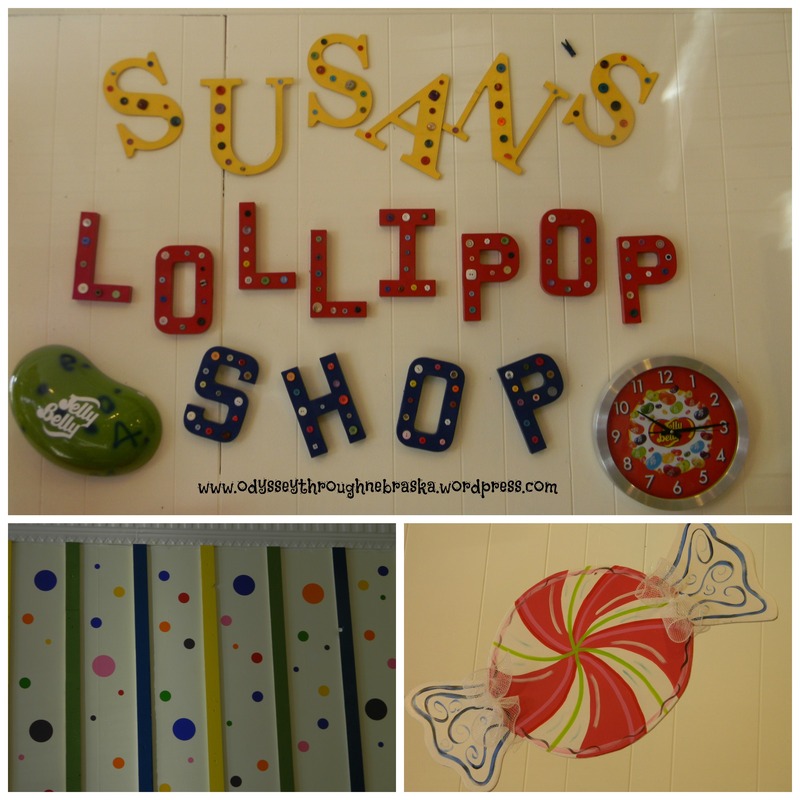 I have never left Susan’s without at least a small purchase – her store just has so much to offer! She has expanded beyond books and toys into candy – a large selection is available, including the world’s largest gummy bear! What do I love most about the store? I do like looking at the creative toys and browsing through books. She does have new selections, but the used books just seem to have more of a story. And the atmosphere is so friendly. But, my favorite part is seeing Susan herself. If I stop by and she is not there, I leave a bit sad. Susan is such a kind and welcoming person. Even though I only make it to the store a few times a year, she makes a point of remembering me and greeting me with a big hug! If you click on the store link, you can see lots of pictures of Susan with visiting kids. (I did not want to post those here without permission from the parents!) She also writes a weekly newsletter complete with book reviews and Latin quotes. If you are a reader, you definitely want to sign up for these – great literary and life insights! I highly recommend visiting Susan’s Books and Gifts in Aurora, Nebraska! One of my very favorite organizations makes a huge impact halfway around the world despite being based in Lincoln, Nebraska. Tiny Hands International is helping make a difference in the lives of women and children in Nepal, India, Bangladesh and beyond. I happen to know many of the people directly involved in this ministry, and I am grateful to see all that they do to make a positive difference. Hey Everybody! We’re having an Open House this weekend and we want you to come! Lots of new Freedom Products to choose from which make great Christmas gifts. You will have an opportunity to Buy Once, Give Twice when you purchase a Freedom Product and donate it to City Impact‘s Gifts of Love store. Anyway, here is picture of just a few items that will be for sale today! They also have jewelry and beautiful scarves. Many of these products are actually made in Nepal. If you will not be in Lincoln at all during the next few days, you can also order online. To learn more about all that Tiny Hands International is a part of, please click here. Did you realize that there is a whole network of products that are not only sold in Nebraska but are also made here? And they even have specific stores across the state where you can buy local products? Today is a great day to check out Grow Nebraska! With locations open year round in Kearney, Grand Island and at the Omaha airport, you can check out exclusive Nebraska products. Not near any of these locations? You can also purchase online through Amazon and E-bay. At their Buy Nebraska site you can actually view of the products for sale – they have a very user friendly search engine with categories such as art, gourmet food, books/cds and even gift baskets, there are many products to choose from. I have to admit that I am a bit partial to one product. My mom’s cousin and his wife have their own line of Holen One gourmet food products. Image from their Holen One Farms website! Pictured above is their Java Rub – our family’s choice for great grilled meat. Besides making delicious marinades, they also sell custom made grills: the Bar-B-Cow and the Boar-B-Q. You will have to check out those pictures on their site – they take grilling to a whole new level. Whatever gifts you are looking for this Christmas season, this is a great year to buy locally made Nebraska products! For the past several Black Fridays I have gone shopping. That is, after I wake up at my normal 5 a.m. time – nothing earlier for me, thank you. And while the big box stores definitely advertise their deals, the local little guys also have specials going on during this big shopping day. 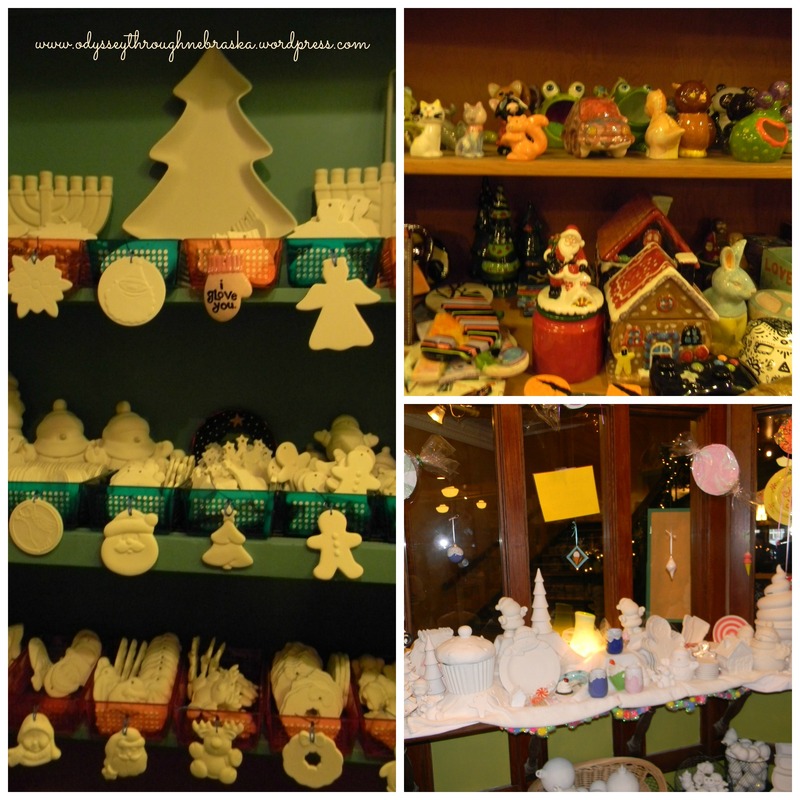 Hallow Candle is an adorable shop that is located at 33rd and “O” near downtown Lincoln. This store happens to be next door to our chiropractor (Dr. Kyle at the Joint), so I often stop by throughout the year. But especially on Black Friday they have fun deals – you can check out their specials for this year below. (Did I mention that they also sell really cute jewelry at their store? I love my Husker necklace!) For more information, check out www.HallowCandle.com. *All Earrings Buy 2 Get 1 Half Off! ALL Hallow Products 15% OFF ALL DAY LONG! 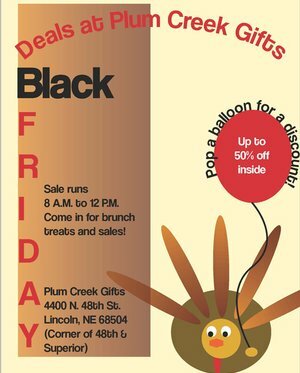 Since I value my sleep, I barely make it to any stores in Lincoln before Black Friday deals end. So the thought of making in time to another city had never occurred to me. Until now. Maybe this will be my goal – after all these 2 local stores have specials all day – not just for the early birds! Thanks, Kim, from Oh My! 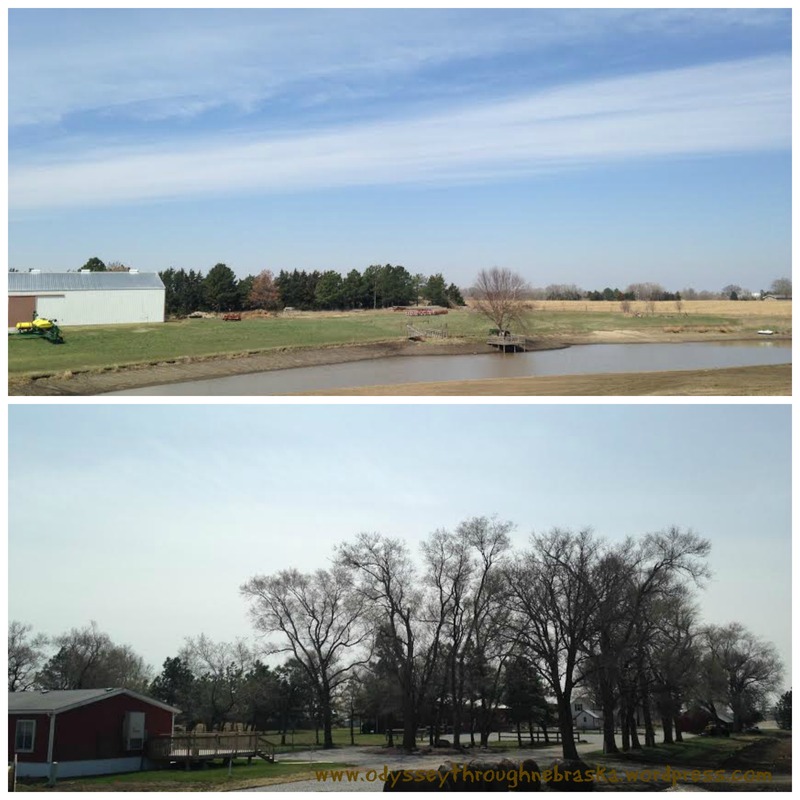 Omaha for sharing these 2 places with us! There are a lot of locally owned stores in Omaha, but two that are great for Christmas shoppers looking for unique gifts are The Afternoon and Le Wonderment. Luckily, they both have Black Friday deals for bargain hunters. The Afternoon has two locations in Omaha: the original is at Westroads Mall, and the other is at Midtown Crossing. 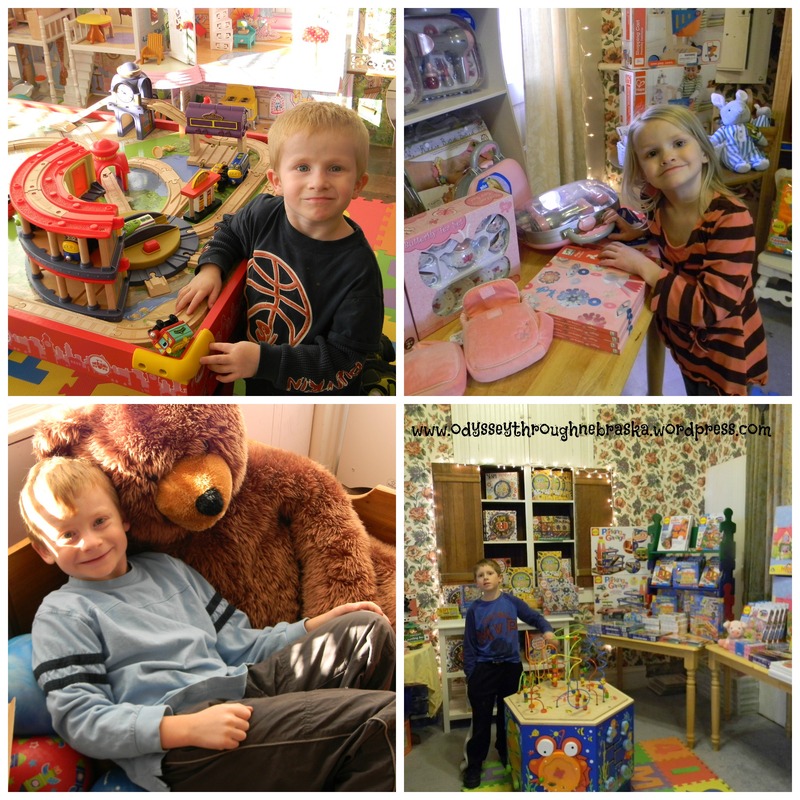 This place is great for gifts for everyone – the foodie, the creative, the traveler, the young, the funny – things you won’t find in a big box store. On Black Friday, save 25% all Christmas items (dept 18) at the Westroads location from 6 a.m. to noon and at the Midtown Crossing store from 10 a.m. to 3 p.m. Saturday and Sunday, you’ll get 25% all Melissa and Doug items at both stores. If you are wanting to shop local in Lincoln, picking where to start can be a challenge. I know that there are many small stores in Lincoln that I do not even realize that they exist. I guess I tend to go to familiar places. If you are like this, here are some links to let you know about some of the great local places that are here in Nebraska’s capital city. And if you miss any of the deals today, many places are offering special deals for “Small Business Saturday” – tomorrow is another great day to support area businesses!